Presented screenshots are from L1.02 BIOS/UEFI but it looks exactly the same in 1.00 official release. Nearly every new ASRock BIOS looks similar and differences are in available options so at least first tabs are clear for most users and those who were using ASRock motherboard from last generations will easily find everything they need in the tabs with more advanced settings. If you just want to set everything quickly then leave all settings at auto. If you want to play some more with settings and try your luck in overclocking then there is no better place to adjust all the settings. In advanced settings tab you will find all the options related to integrated devices like storage controllers, audio or USB ports. Everything is well described so even less advanced users shouldn’t be lost. In the hardware monitor tab we can check temperatures and voltages but also set fans speed. As you can see, we can adjust speed of all the fans. There is also connector for water pump. The only weird thing is that CPU temperature seems too low. Sensor is showing idle temperature near 20°C and sometimes even lower while room temperature is about 23°C. 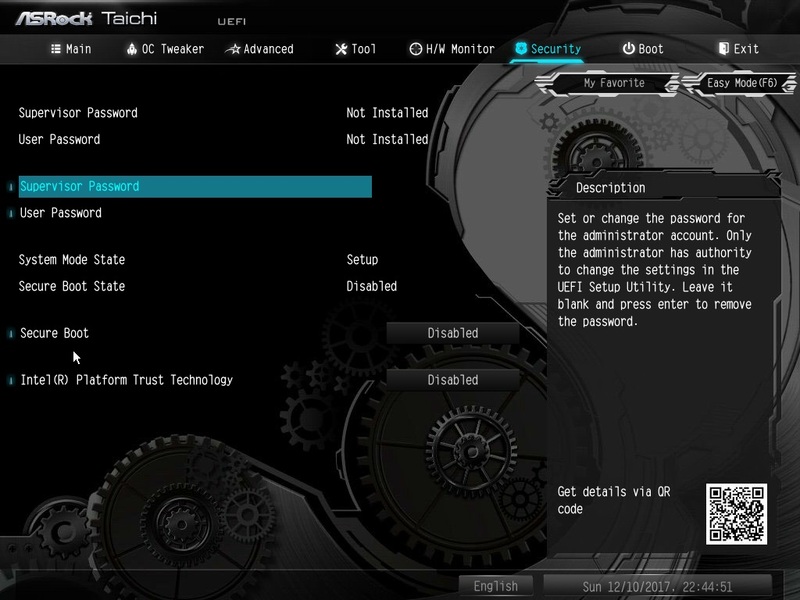 Security tab is where you can set secure boot settings and BIOS password. 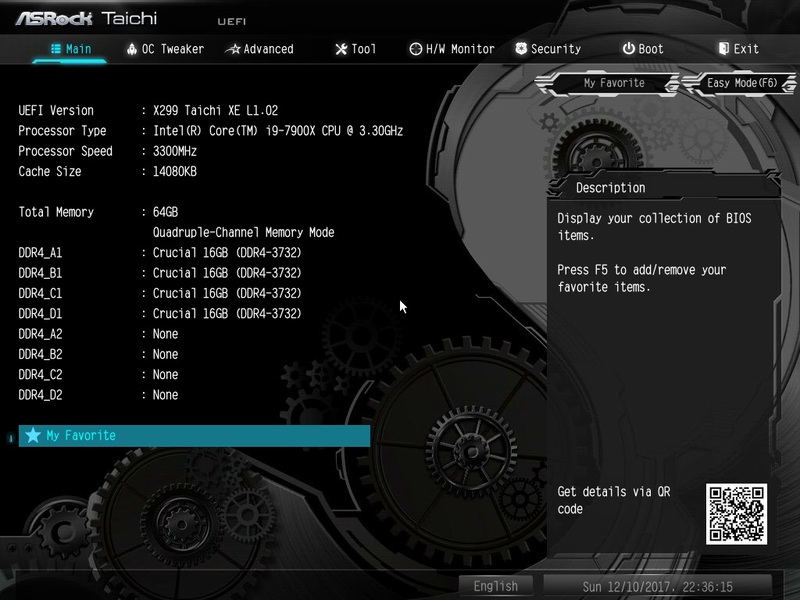 The Taichi XE comes with many additional features and also BIOS/UEFI is exceptional. We can update BIOS directly via Internet or send support ticket without using OS. On the tools list is also RGB LED adjustment. There is LED lighting under the chipset heatsink but also additional RGB connector if we wish to add LED stripes. 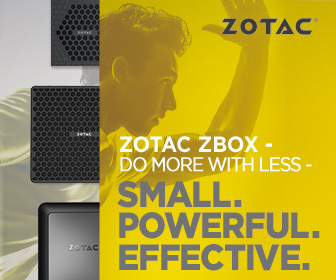 All that can be managed from BIOS or Windows application. Boot tab is clear. We can find here all options which let us to start operating system. 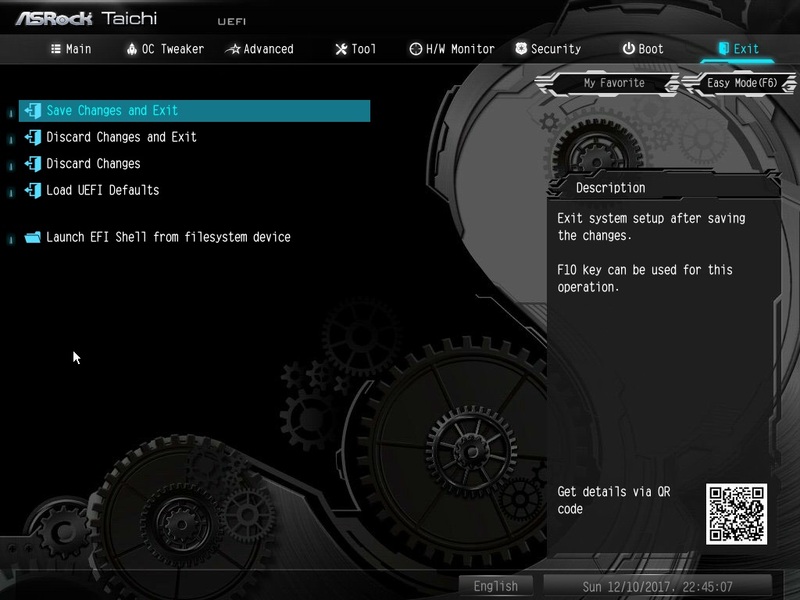 In the Exit tab we can save BIOS/UEFI settings and restart our PC, load UEFI defaults or enter EFI Shell. Let’s move to the next page of this review to take a closer look at the motherboard itself.